FIGYELEM! EZEK A PÉNZINTÉZETEK NEM KÖTHETTEK VOLNA SZERZŐDÉST! DEVIZÁSOK! 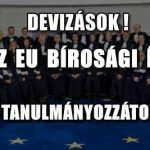 ITT AZ EU BÍROSÁGI ÍTÉLET-JELZÁLOGKÖLCSÖN, TISZTESSÉGTELEN SZERZŐDÉSI FELTÉTELEK, SEMMISSÉG.